Last week I made a point of stopping in Northcliffe in the Southern Forests specifically to visit the Understory trail. I can’t even recall now how I heard of this, but have long been aware of a sculpture trail through the forest and have happily promoted it to plenty of people without ever having visited myself! Remedying this was a key focus for visiting the south west on this trip. And yes I will continue to happily promote and recommend it to others! I developed an interest in sculptures set amongst natural landscapes whilst in England – firstly from exploring Grizedale Forest by bike in the Lake District on one my days off from a pub job in nearby Coniston; and later from volunteering through The National Trust to lead a team of volunteers helping artists to install an annual temporary exhibition – the Hebden Bridge Sculpture Trail in the Hardcastle Crags forest reserve in the Yorkshire Dales. Since then, I’ve enjoyed visiting Sculpture by the Sea exhibitions in Sydney and Perth, and I seek out similar experiences whenever and wherever I travel. Back to Understory – and to my happy surprise, I discovered on paying the entry fee that there is also a musical component to Understory – a CD called Canopy. This includes 12 songs / compositions commissioned from Western Australian artists to provide a varied range of musical responses to the site and Northcliffe – whether that be focussed on nature, history, culture or community. As I wondered the trail, I listened to an audio tour featuring interviews with the musicians, who provided the background and inspiration for their works over snippets of the actual tracks. I was entranced! Although it was a bit unnatural to be shut off from the natural sounds of the forests, the evocative music filling my senses and complementing the sculptures themselves provided an extraordinary experience that I won’t forget in a hurry. Fans of prose and poetry would also be pleased with Understory – writers and poets were also commissioned to provide responses, including a series of stories specifically for children, as were of course the sculptors themselves. Understory is a project of Southern Forest Arts, “a way of exploring and celebrating the strengths of our social, environmental and cultural heritage” in the face of the “tough challenges in recent years, particularly with the restructuring of the forestry and dairy industries”. Maybe Manjimup should look to Northcliffe for inspiration! 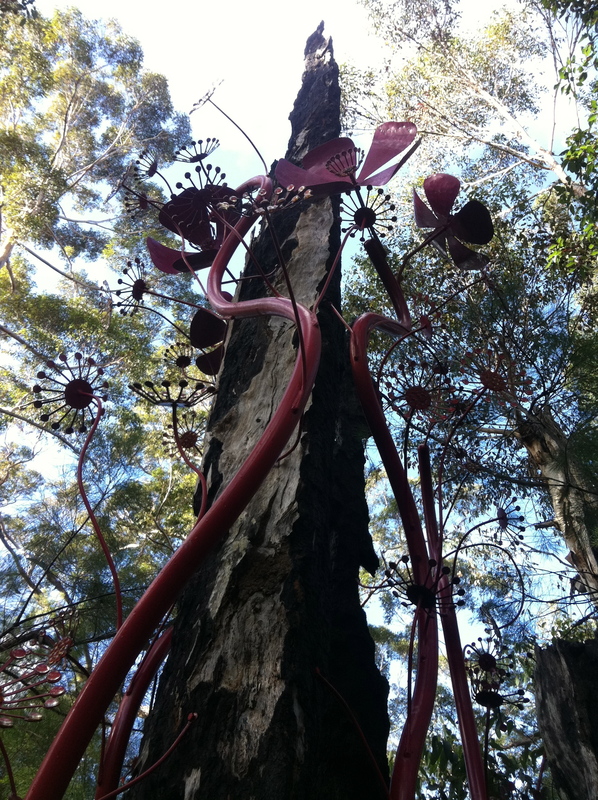 This entry was posted in Uncategorized and tagged Northcliffe, sculpture trail, Southern Forest Arts, Understory. Bookmark the permalink.